These trees are much photographed. They are easy to get to, on the Parkway where Green Hill Road intersects. I call them 'Brother Trees' because another sest of trees I shoot I call 'Sister Trees.' This Fall, at this time one had shed its leaves but the other had not. 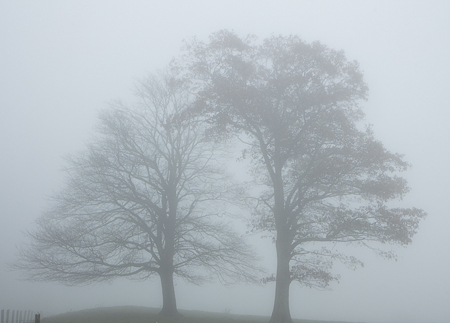 I hadn't noticed that on site while shooting them, in my excitement to find the trees so perfectly in fog.